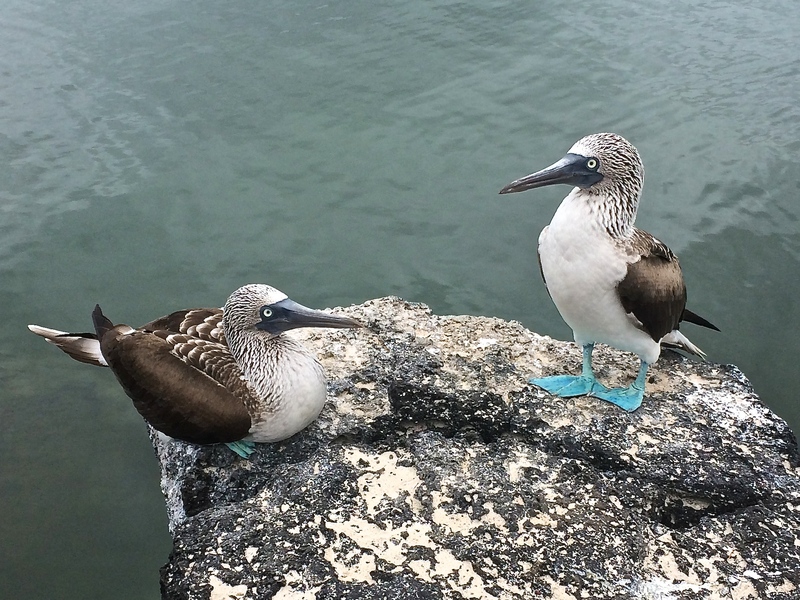 We came to the Galapagos for one primary reason: to experience the wildlife, particularly the blue footed boobies. 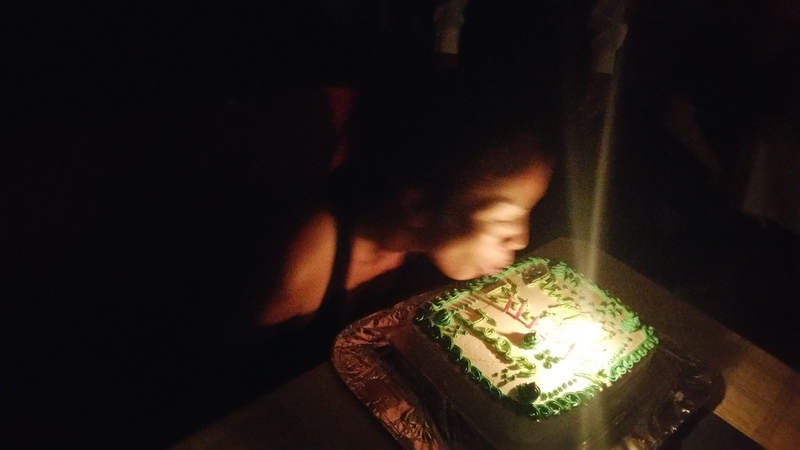 They say that you will take many more pictures than you anticipate, and they were right. Wild animals, galore! 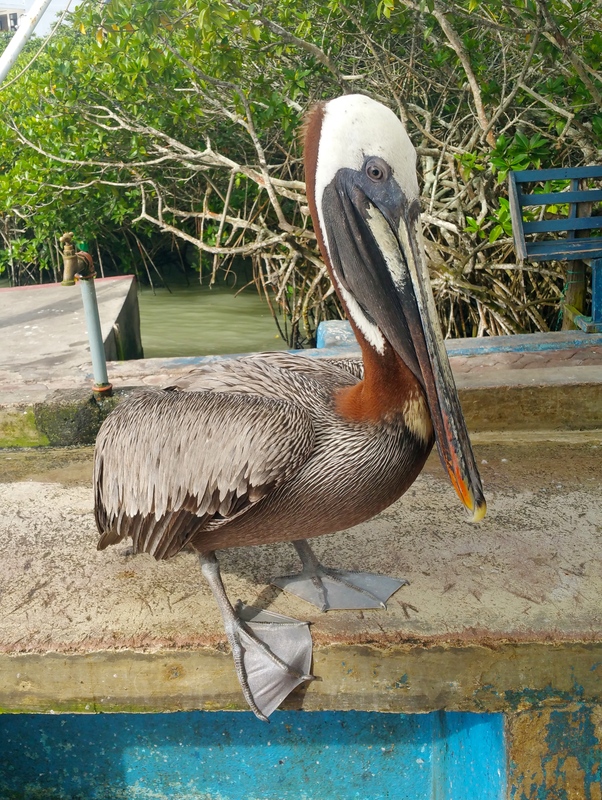 During our transport from the airport to Puerto Ayora, our bus slammed on its breaks for a giant iguana crossing, and when we reached the canal, hundreds of blue footed boobies were diving into the ocean. 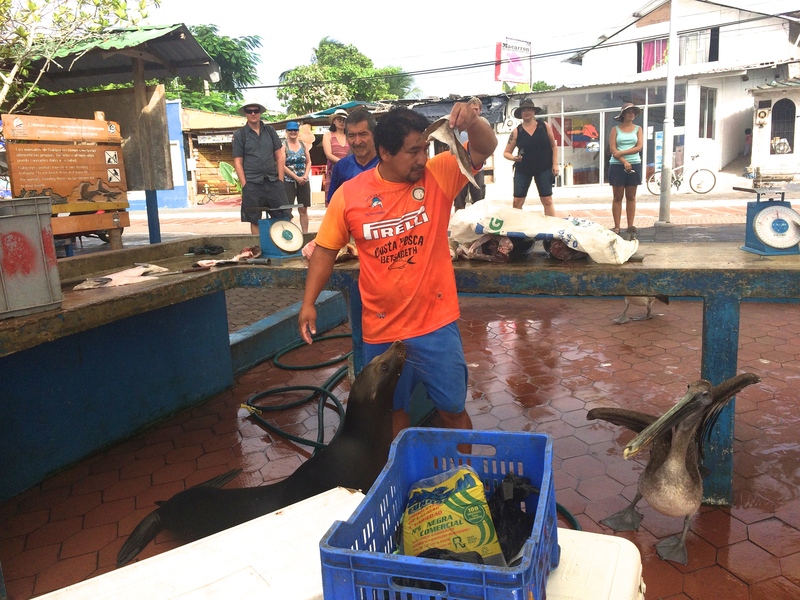 Sea lions and pelicans always competed for a tasty treat at the local fish market. 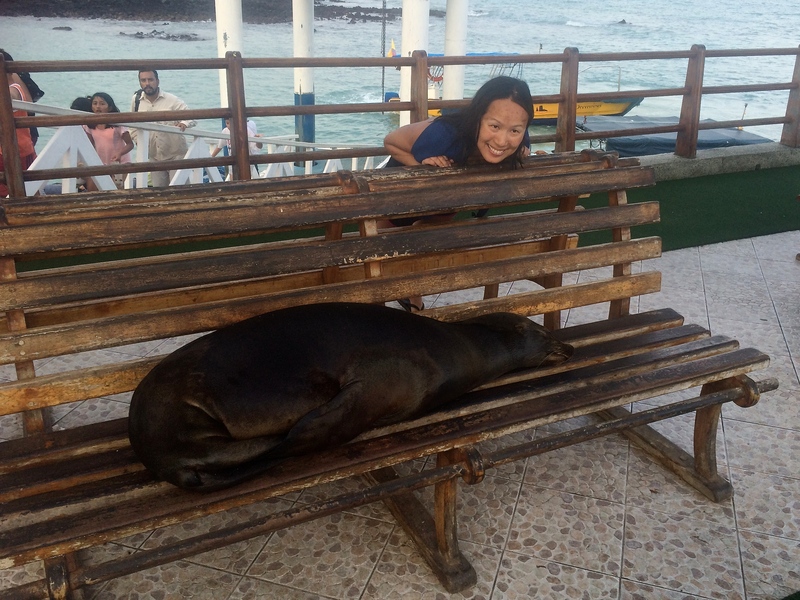 Oh, and you know, just a water dog sleeping on a park bench. 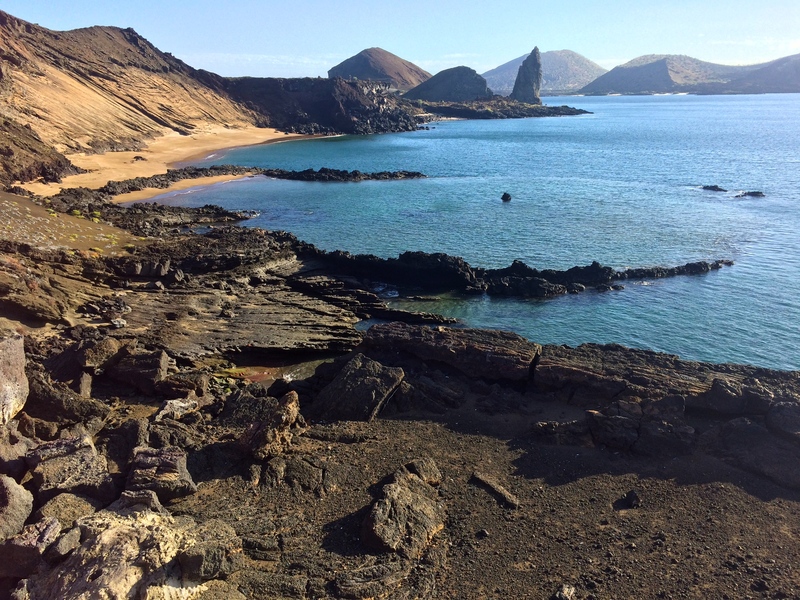 On Santa Cruz Island there are several places one can visit for free. 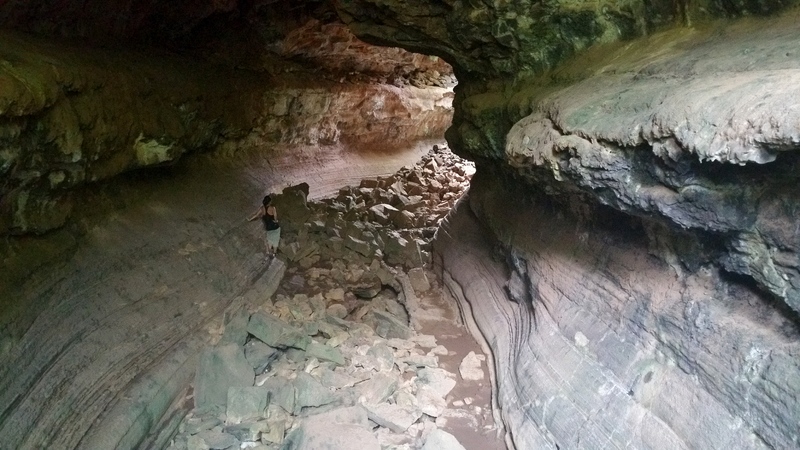 (Well, it’s technically not free since everyone pays the $100 national park fee, but these excursions don’t require an additional fee.) 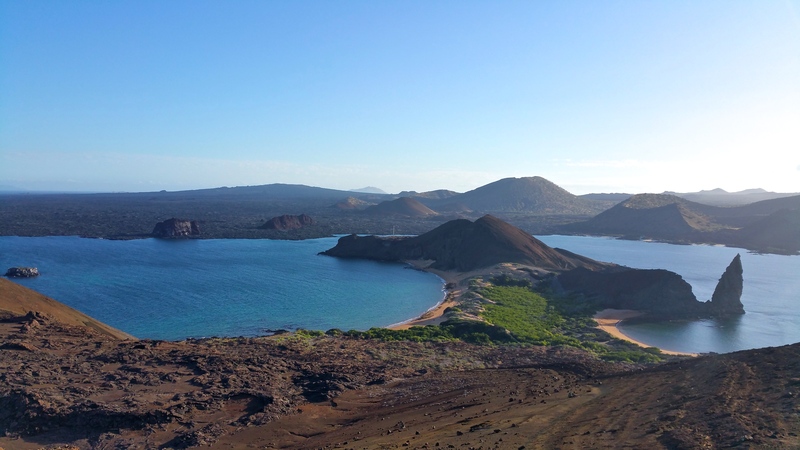 These places include Las Grietas, Tortuga Bay, The Charles Darwin Research Center, the Tortoise Reserve, and some lava tubes. It costs only 60¢ one-way for a taxi boat toward Las Grietas. 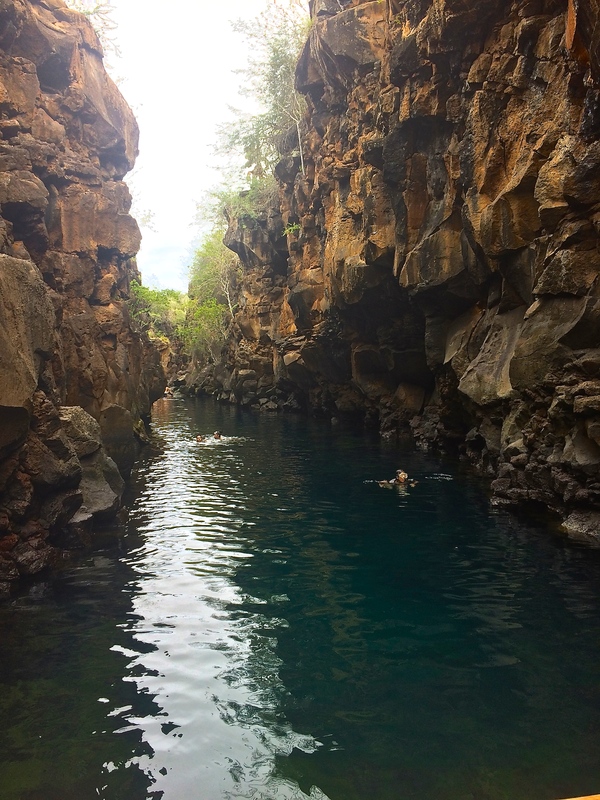 Once off the boat it is a quick 10 or 15-minute stroll to Las Grietas, a canyon filled with a mix of fresh and ocean water. Its low salinity was wonderful, the water was exceptionally clear, and fish could be seen swimming around. Great place for a swim. Tortuga Bay isn’t the most beautiful beach or bay, but it is one of the few places one can just sit and relax in Puerto Ayora. It is easily walkable from town, about 6 km roundtrip. I was lucky with my first visit. 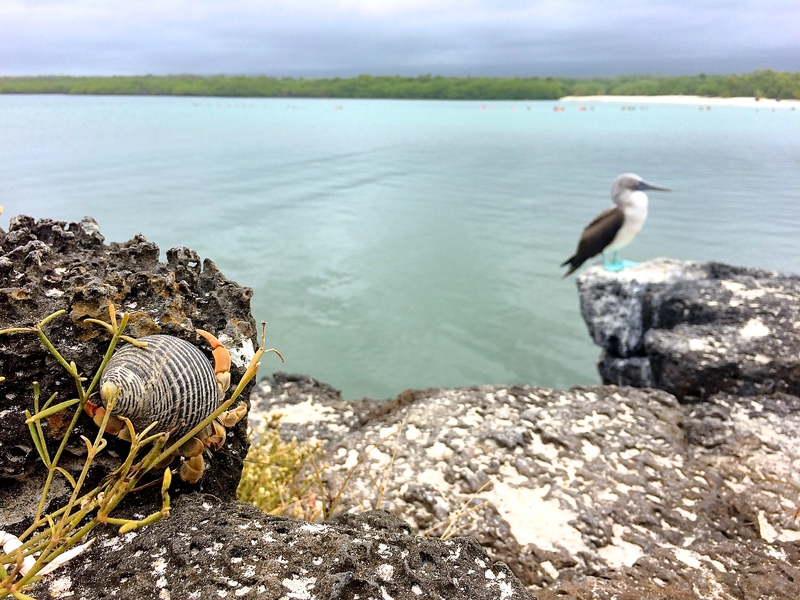 Not only were there a myriad of marine iguanas, but I also got up and close with a couple blue footed boobies!!! I returned with Chris a second time and there were no boobies…just pelicans. 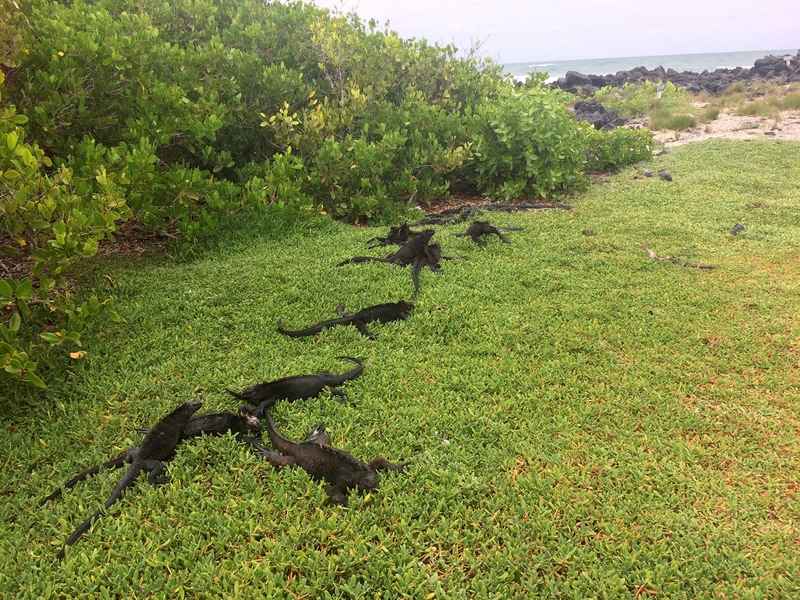 A ton of marine iguanas. 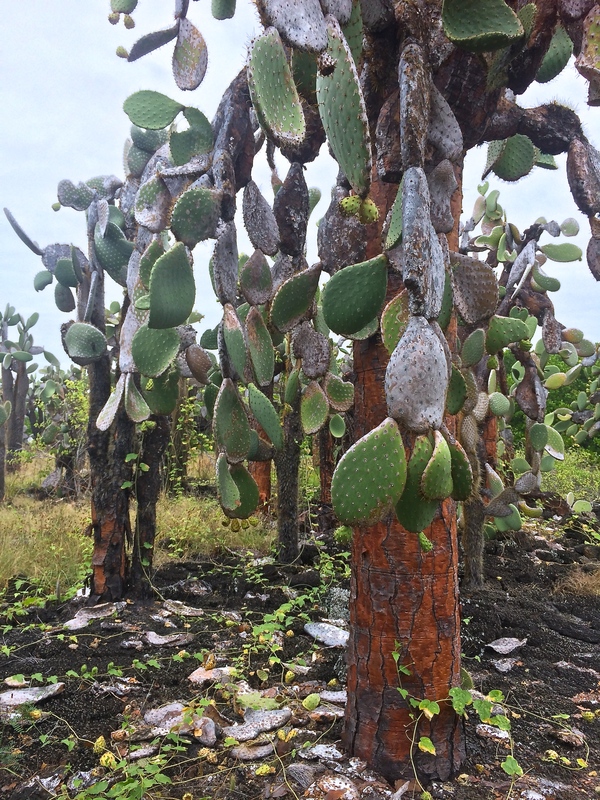 And lots of opuntia cacti, only native to the Galapagos. 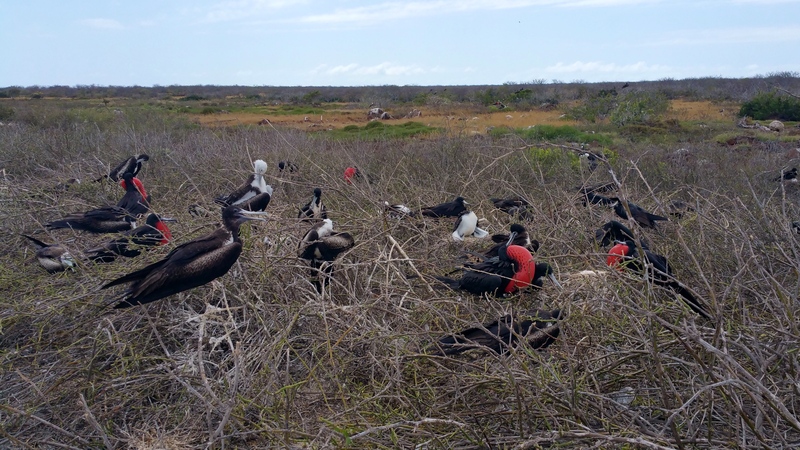 The Charles Darwin Research Center is only a short walk on the far east of town. 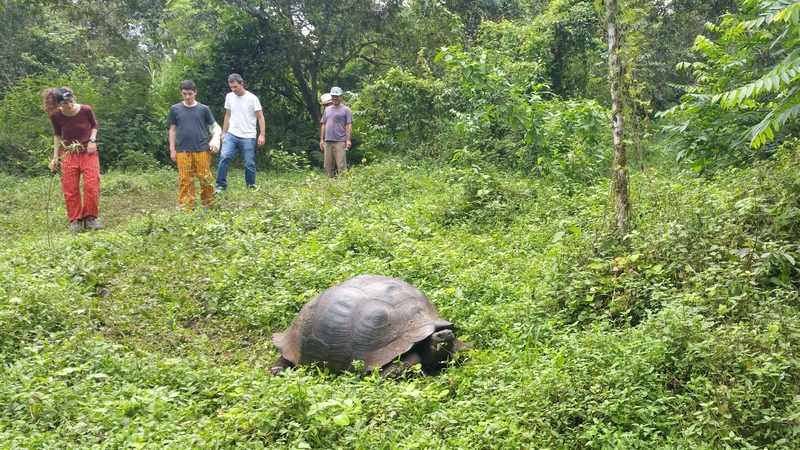 There, they breed giant tortoises! 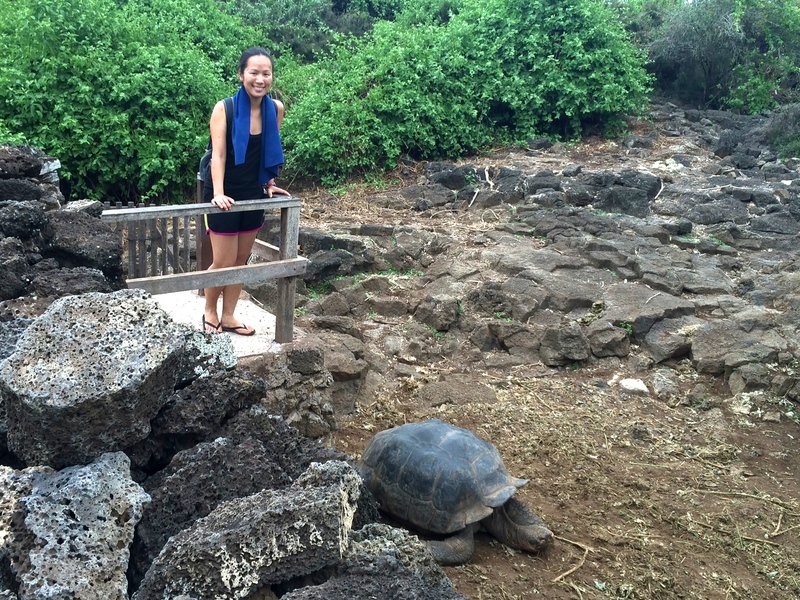 A bunch of baby tortoises can be found lying around, but I was more interested in the giant ones. 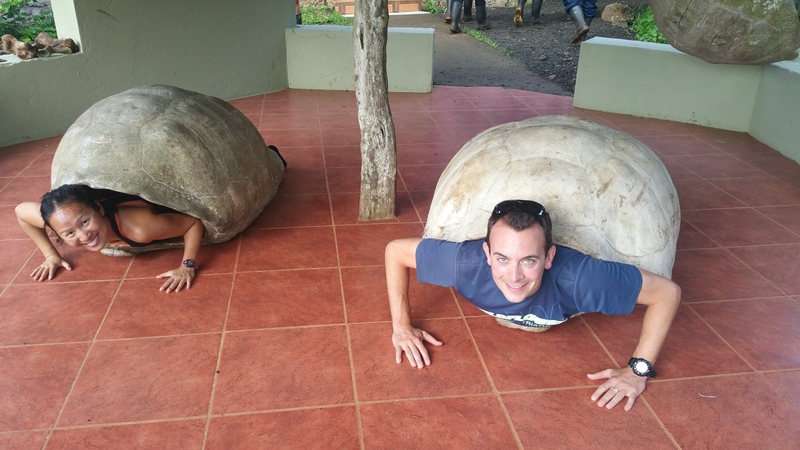 You can also be tortoises tourists at the reserve. 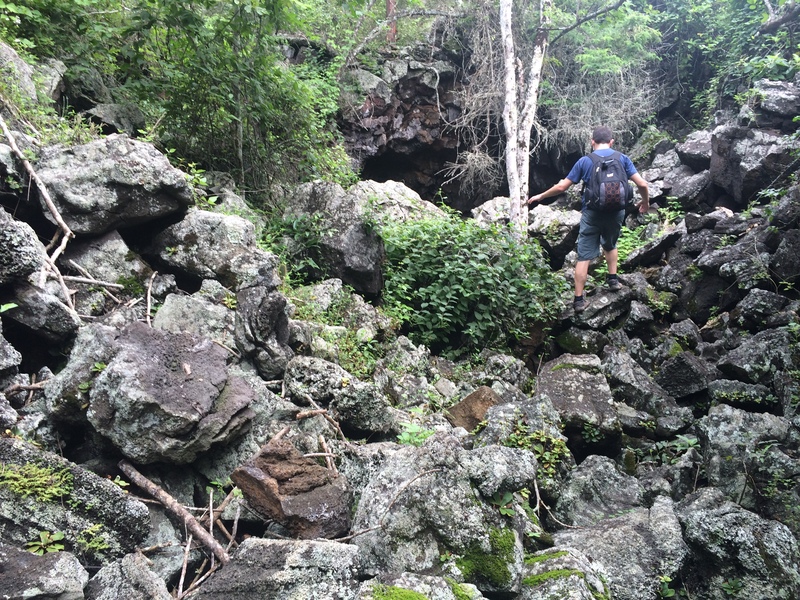 We also visited the smaller, less-visited lava tubes called El Mirador, just 3 km north of town. Probably only worth checking out if you have time to kill. 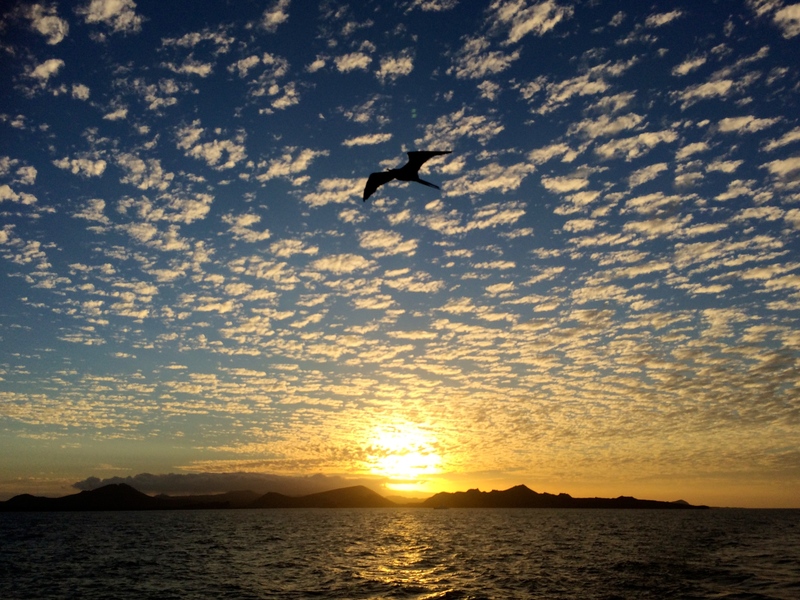 Although Santa Cruz is the main island, two other habitable islands are San Cristobal and Isabella. I believe there are 13 islands on the map; to include every single microscopic island from the Galapagos would mean hundreds of islands. 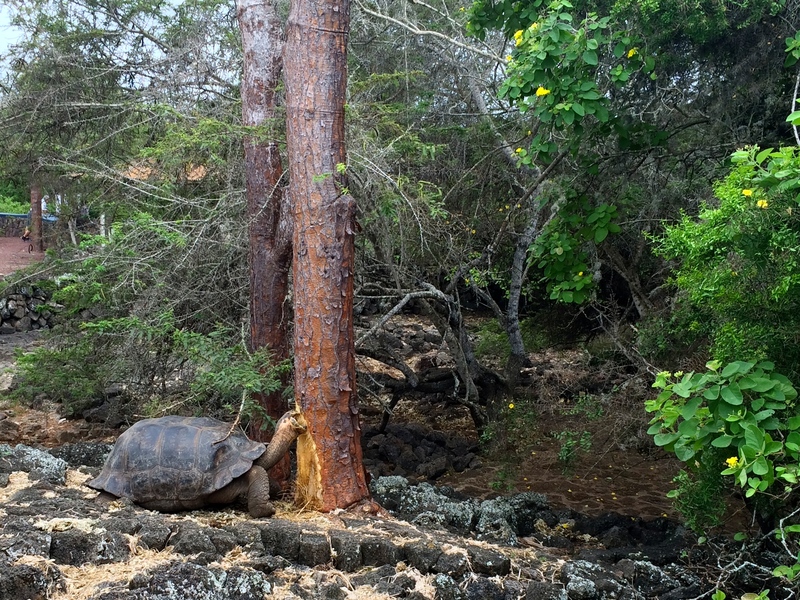 All three main islands offer their own land excursions and neighboring island excursions. Unfortunately we did not have time to visit Isabella or San Cristobal, but we did do one island excursion from Santa Cruz. 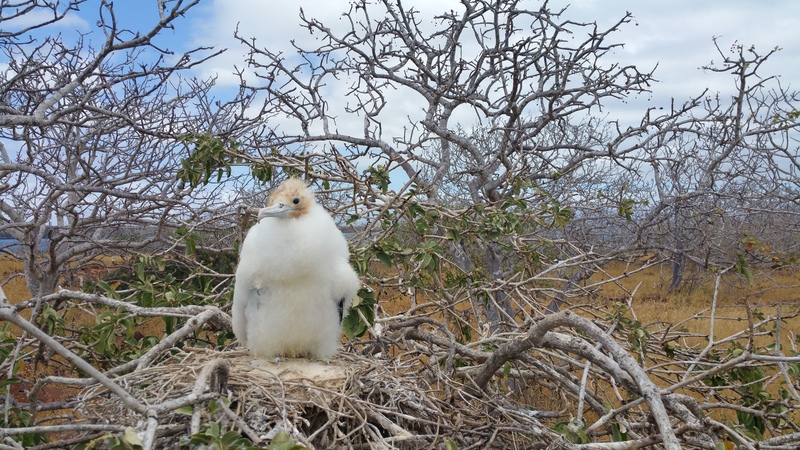 Because our ultimate goal for the whole trip was to witness the famous blue footed booby mating dance, we simply had to go to North Seymour Island, which seemed to be the most popular island nearest Santa Cruz for bird watching. 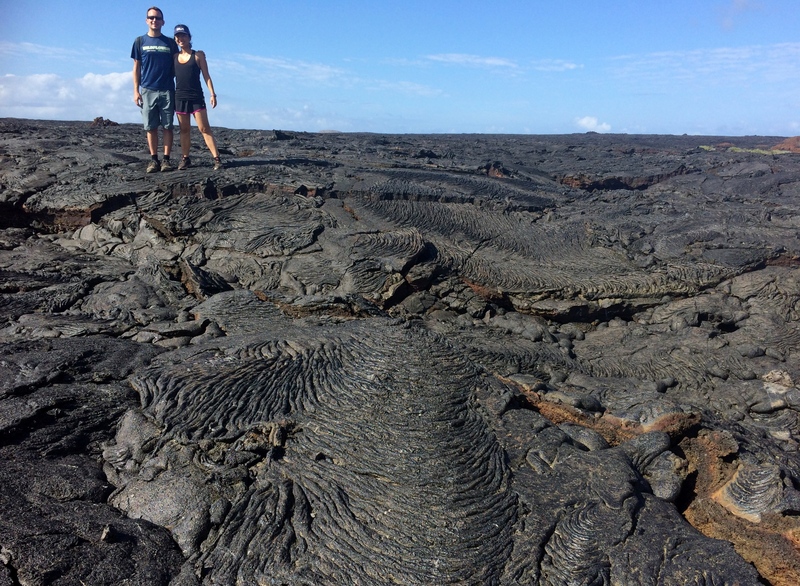 Excursions ain’t cheap–depending on where you go prices range from $80-$200. The norm for North Seymour was $160, but after shopping around, I found a last minute deal for $145. 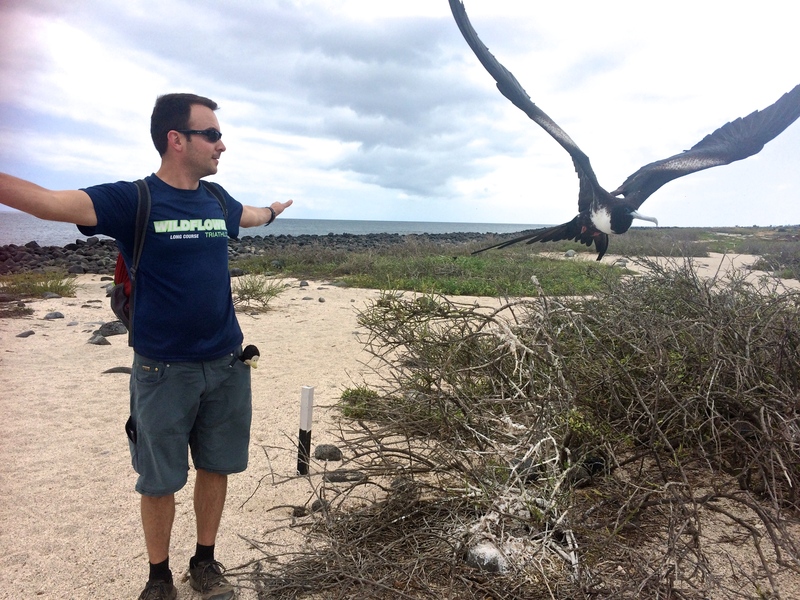 And I will say the hundreds of wild birds and land iguanas made the whole trip worth it. 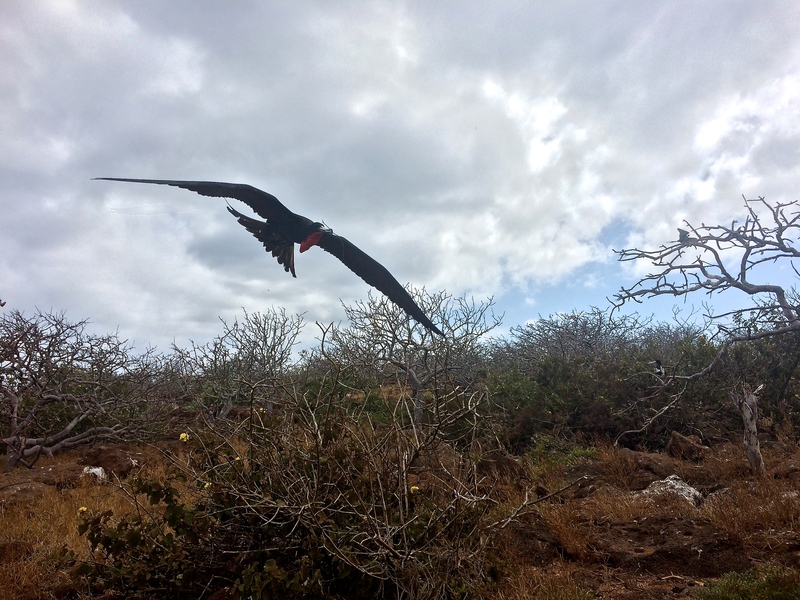 As soon as I made my first step onto North Seymour, a male frigate soared right over our heads. 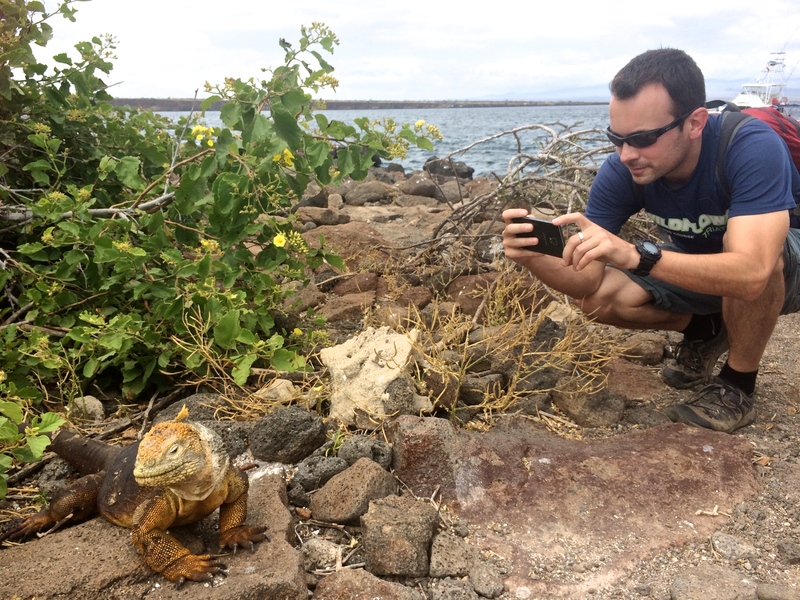 It was common to find iguanas blocking the trail. 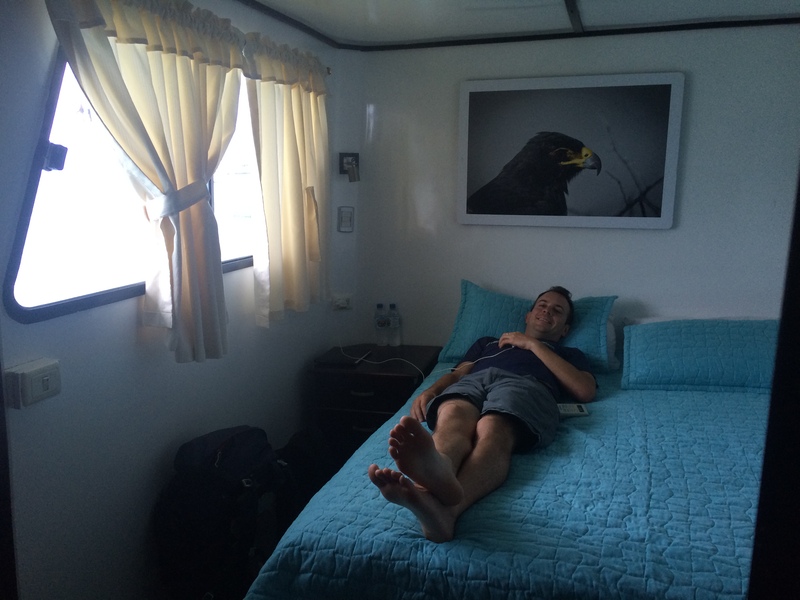 Chris pretending to be a frigate. Yes, you can get this close to them. 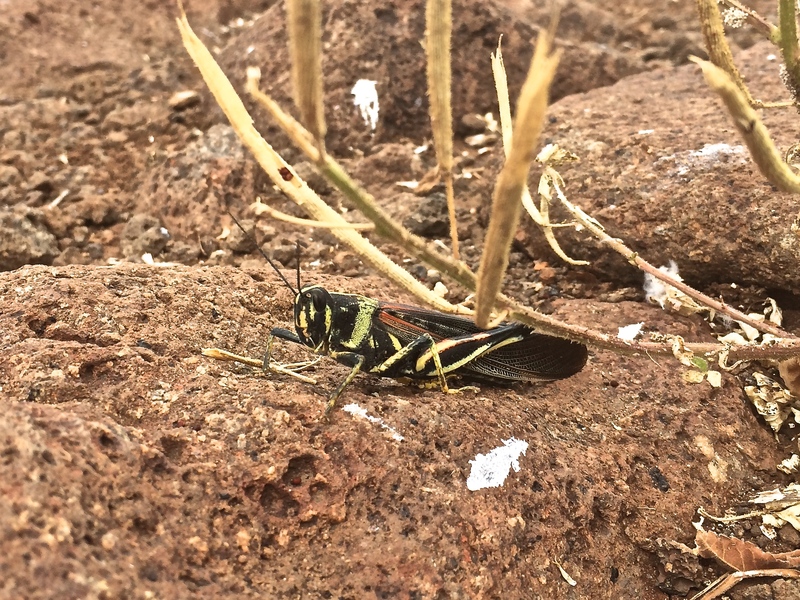 Even the bugs are beautiful, particularly this grasshopper. This is what a baby frigate looks like…a giant white ball of puff. Many just sit there in solitude, plopped on their nests, posed for a picture. 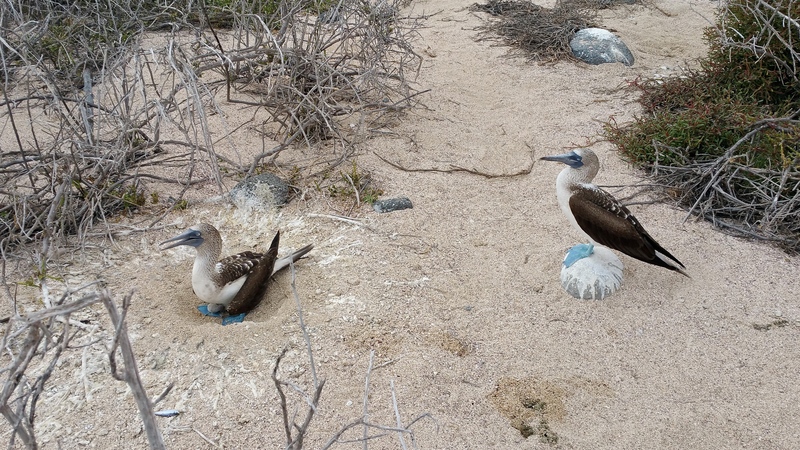 And finally, our favorite…blue footed boobies! Here the father sits on his baby as the mother stands to the side to keep the giant frigates from eating her young. 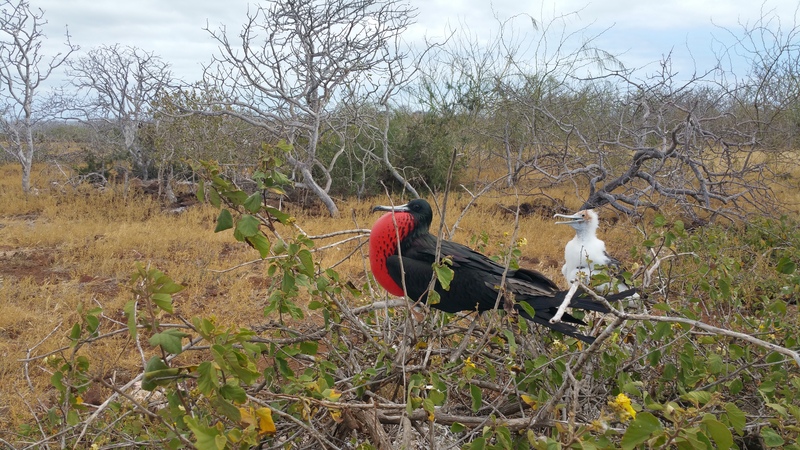 We also fulfilled a dream of ours by witnessing two boobies doing their mating dance; we were quite a distance away so I have no good footage to show. Flights are expensive, the national park fee is expensive, cruises are expensive, land excursions are expensive–hell, everything is expensive! Especially scuba diving! 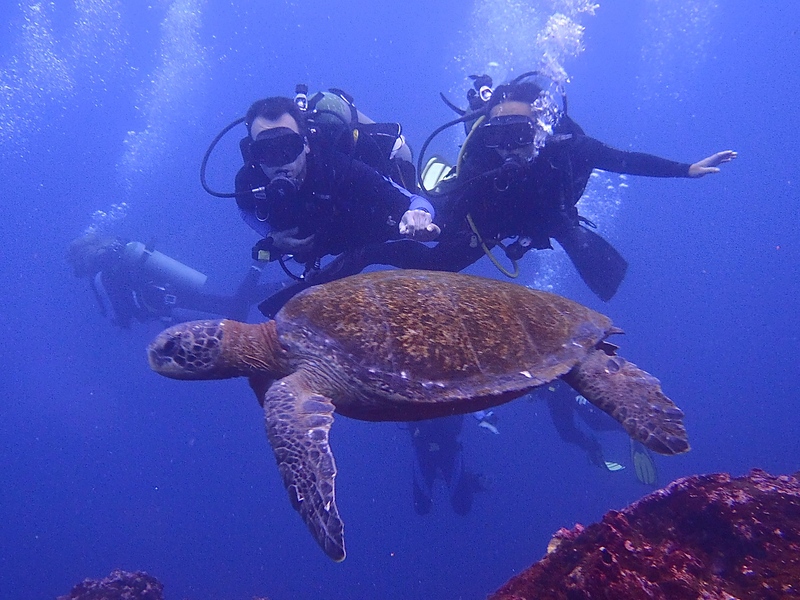 For $170 we made two dives at Gordon Rocks, perhaps the best place to dive in the Galapagos. 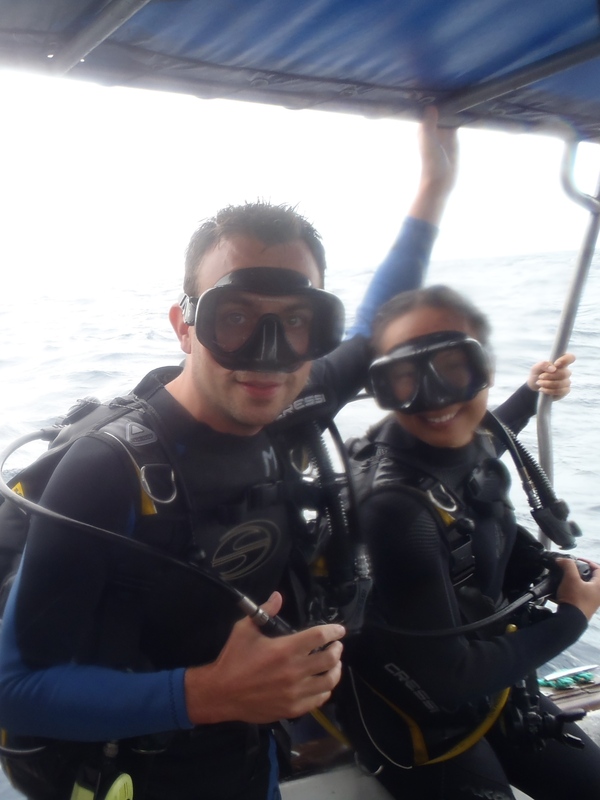 I was merely hoping to see at least one hammerhead shark, but we were blown away with what ended up being some of our best dives ever. 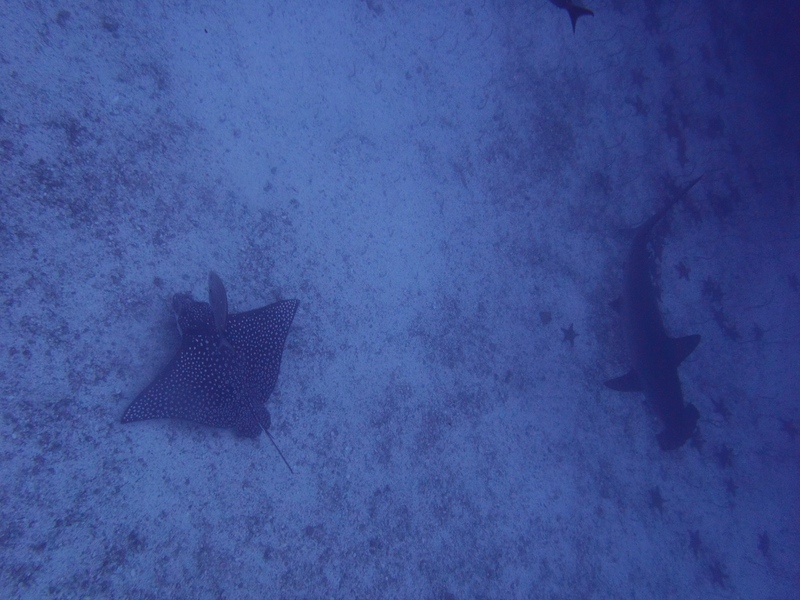 While descending 30 meters down, we immediately spotted a hammerhead shark. 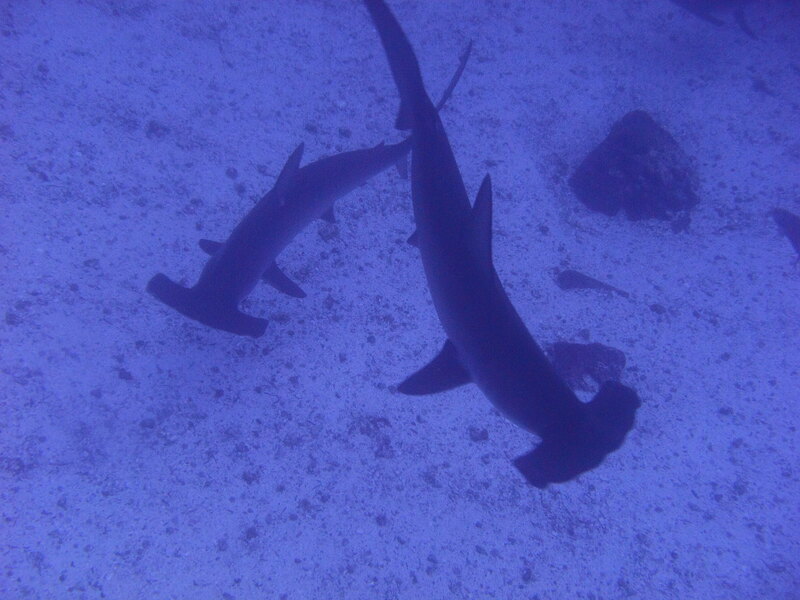 Later we witnessed more hammerhead sharks than we could count–over two dozen! 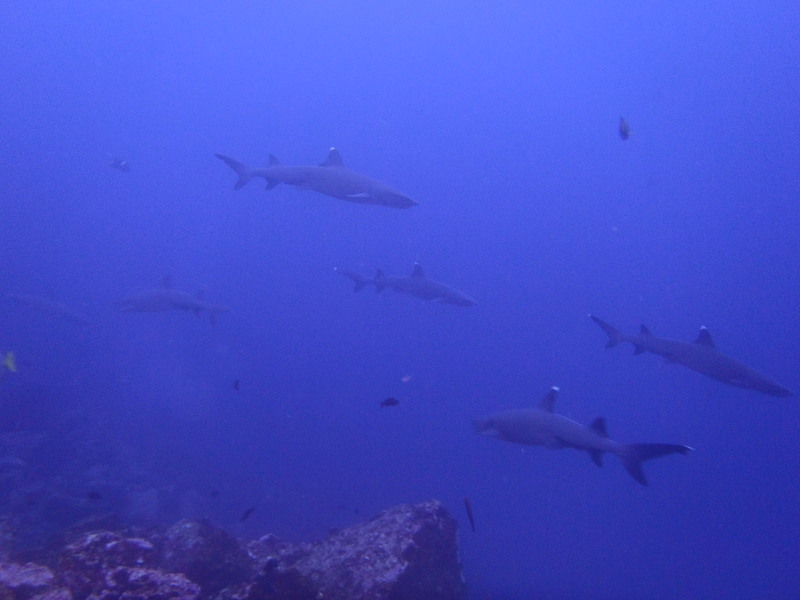 Visibility was not the best, and schools of white-tipped sharks and hammerhead sharks would simply appear out of the ocean mist in a procession. 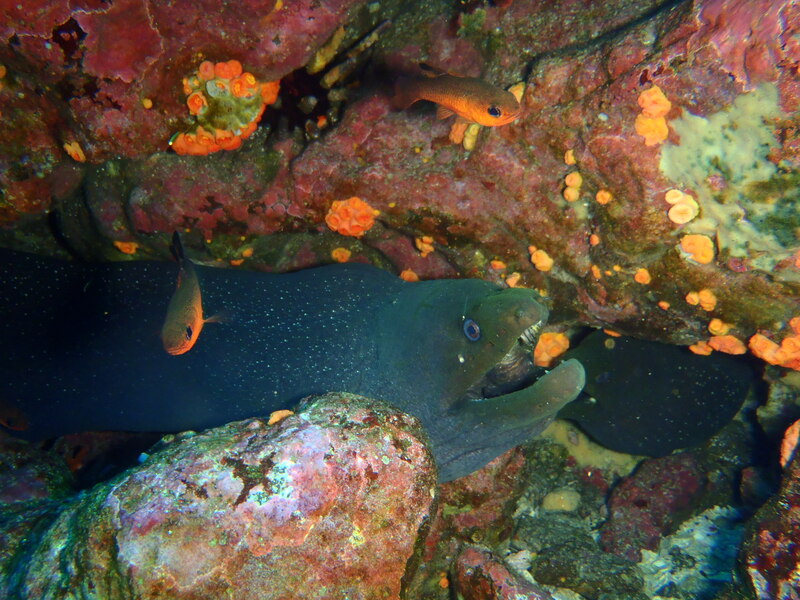 In addition to the white-tipped sharks and schools of hammerhead sharks, we were bombarded with schools of barracuda, sea turtles, a sea lion, morays, and eagle rays. 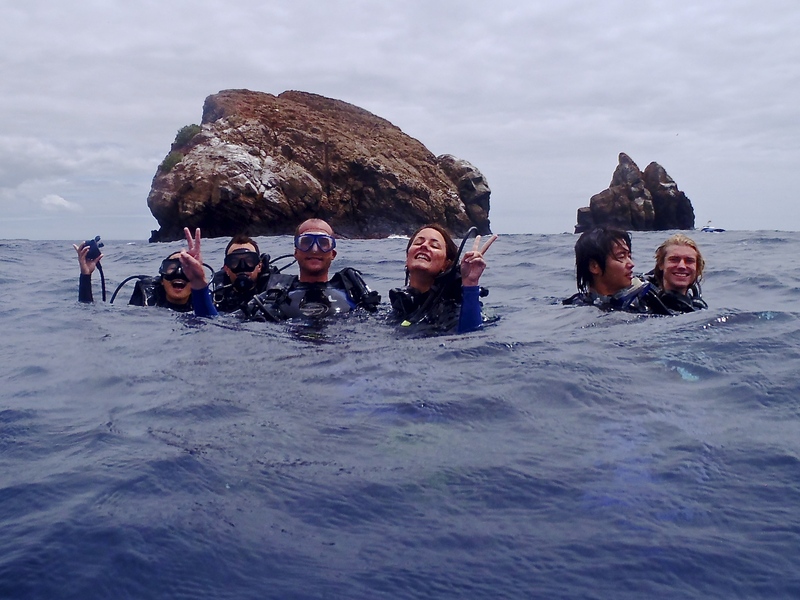 If you are a diver, you MUST dive at Gordon Rocks! Witnessing schools of hammerhead sharks swimming in circles below AND above is almost incredible enough to bring tears to the eyes. 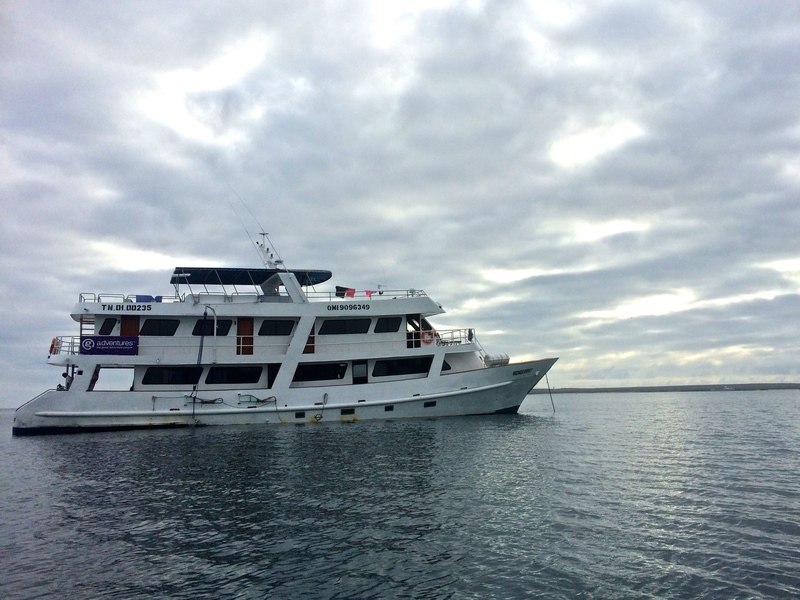 Truly the best way to enjoy the Galapagos is via cruise on a yacht. 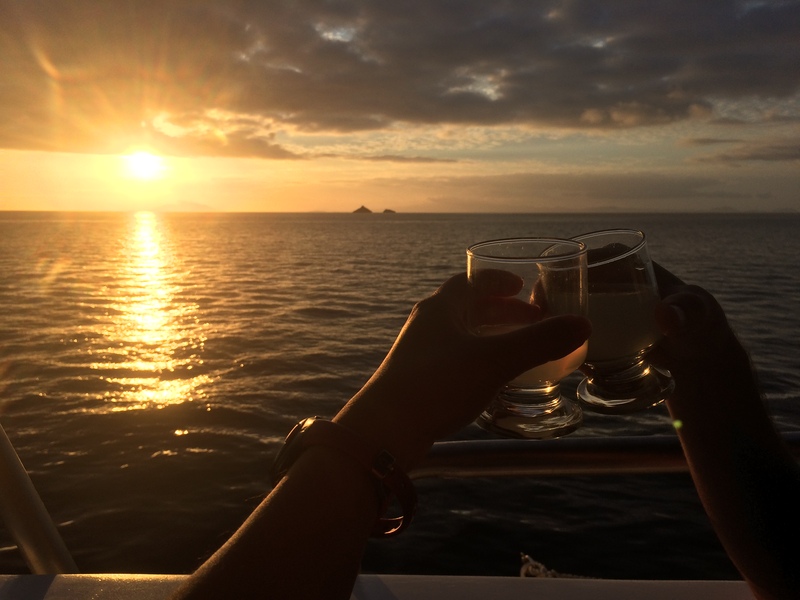 Unlike giant cruises that accommodate thousands of passengers, cruises in the Galapagos are typically limited to a cozy 20 passengers or fewer, which allow great, friendly conversations with other excited travelers during meals and excursions. This may be partly due to the fact that it was my and Chris’ first cruise, but one of the activities we enjoyed most was simply relaxing on a lawn chair on the top deck beneath the shade, cooling off from the ocean wind, and enjoying the landscape passing by as the yacht makes its way to the next scheduled activity. Not only did we save about $1,000 each by booking last minute, we somehow got upgraded to a top deck room with a queen bed, even though I booked the cheapest room possible which was a lower deck room with twin beds. Even an older couple I met who booked in advance got twin beds. As soon as our guide told us our room was in the upper deck, Chris and I immediately exchanged a silent, excited squeal of joy between our eyes. 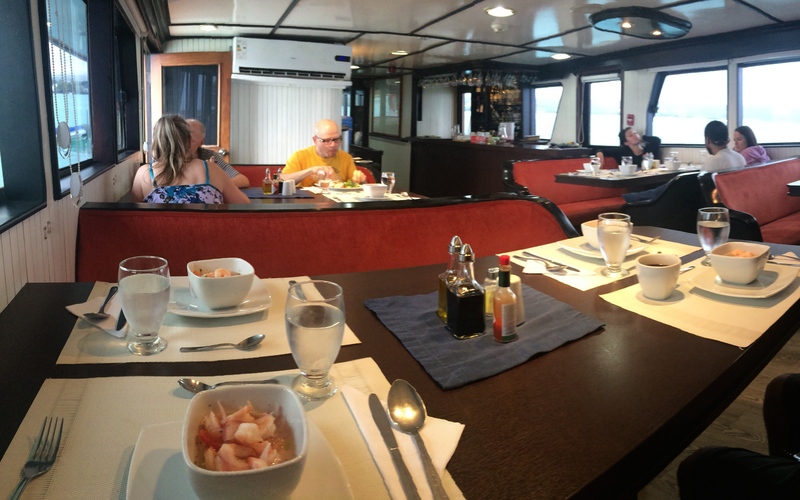 After backpacking and staying in cheap hostels for so many months, it was such a luxury to have all our meals served to us, three times per day. Two activities per day were included, one in the morning and one in the afternoon. 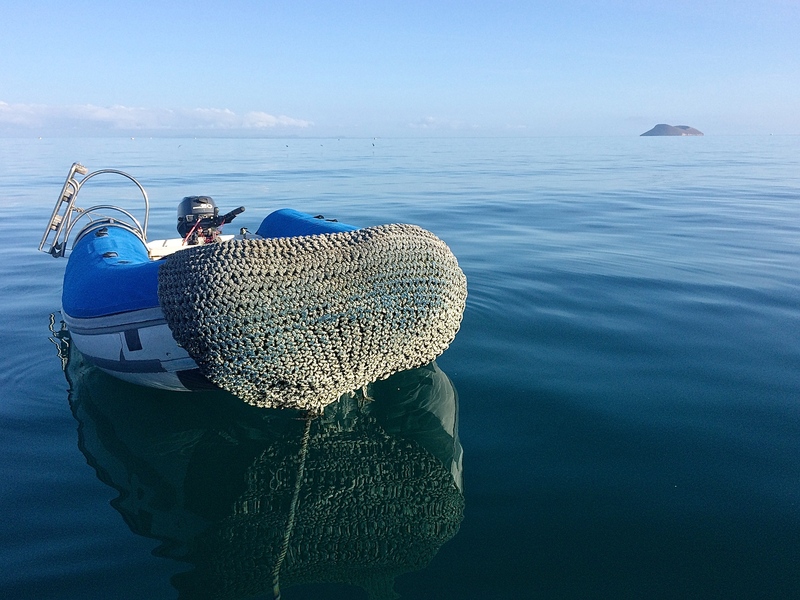 The yacht would remain anchored at sea, and we would ride a dingy to shore. 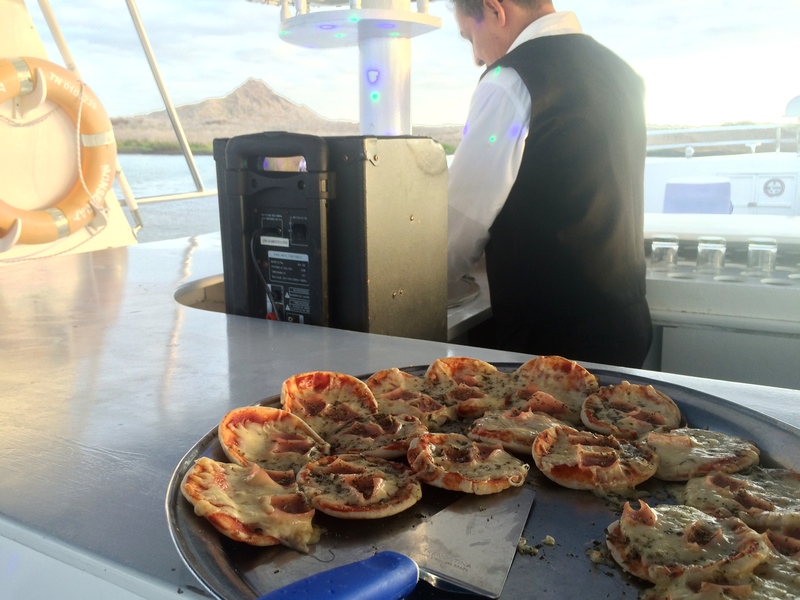 Between activities we were always welcomed back on board with fresh, yummy snacks and fresh-squeezed juices. We saw more animals. 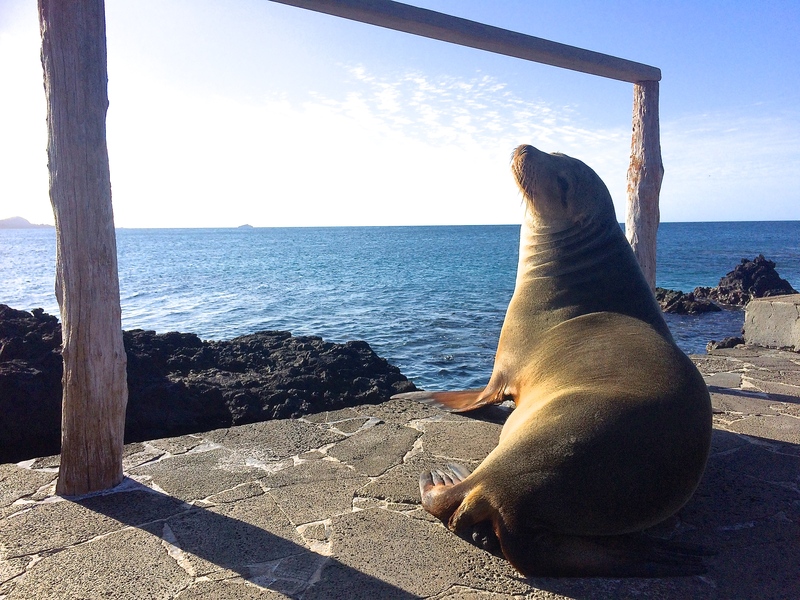 This happy sea lion posed for this photo. 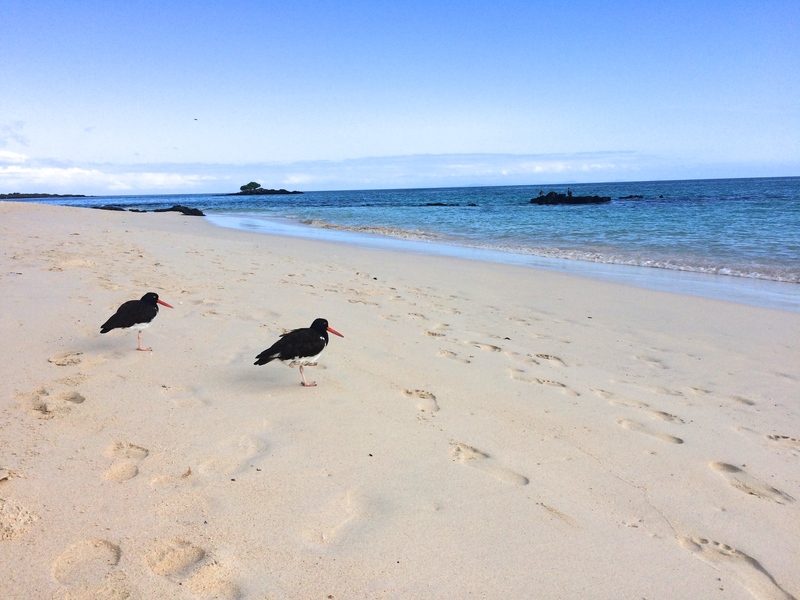 American oyster catchers were adorable (they eat crabs, not oysters). 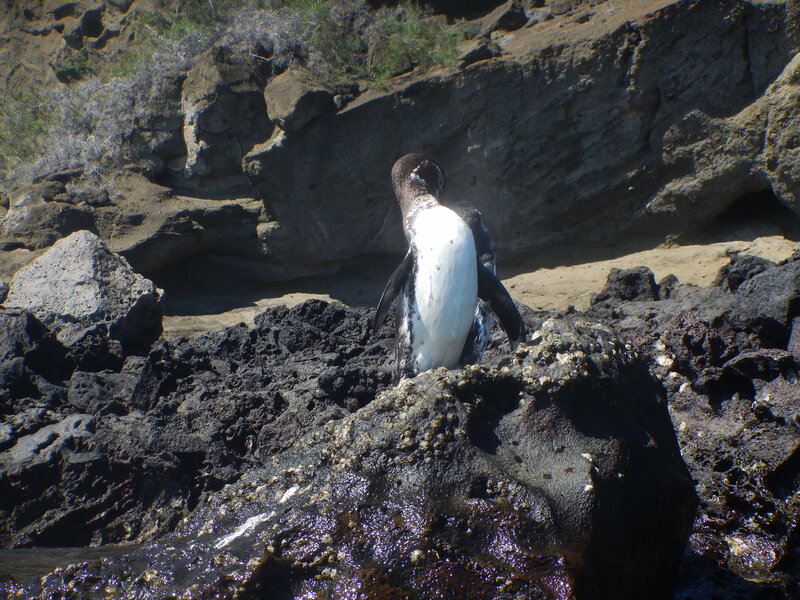 The miniature Galapagos penguin, only native to the Galapagos! 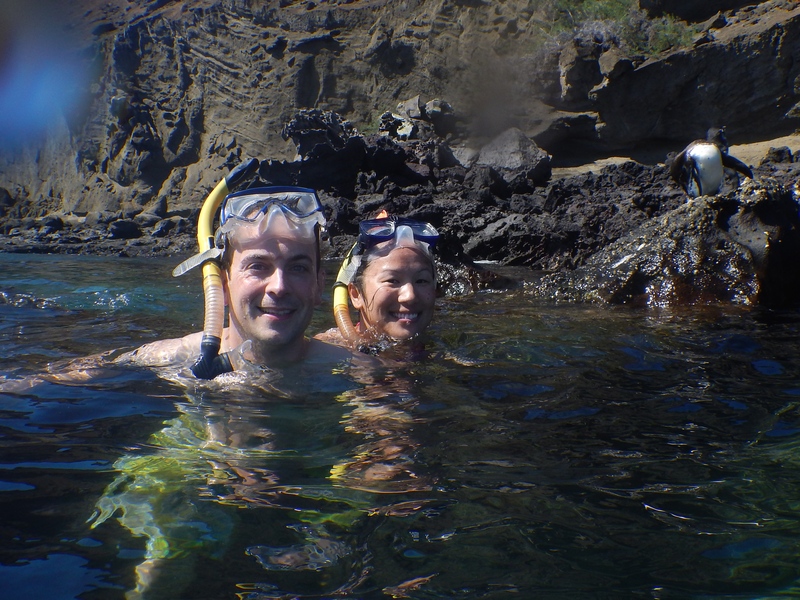 We even snorkeled with the penguins! 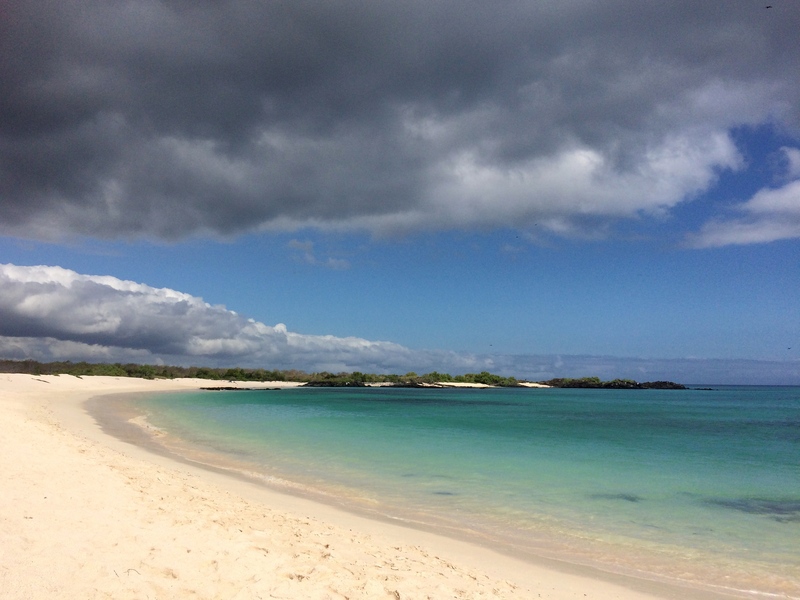 We visited beautiful, interesting islands and white, sandy beaches. 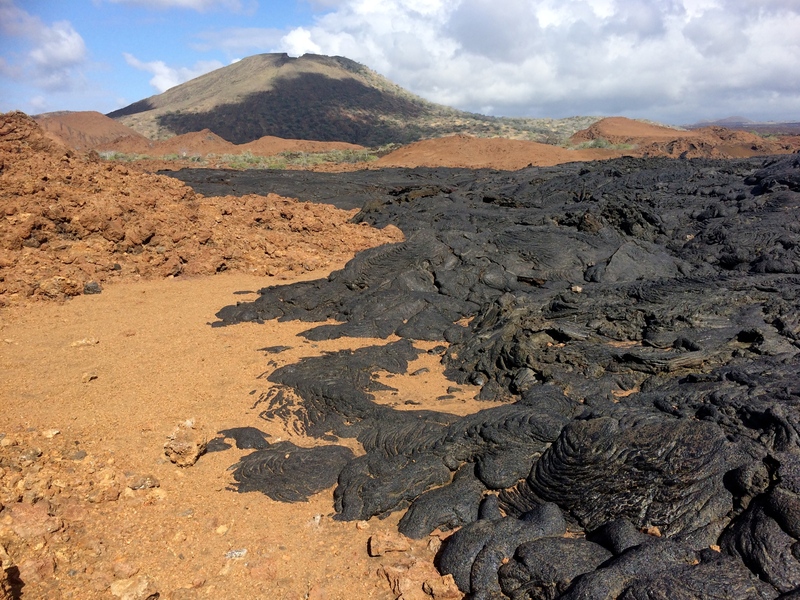 Sullivan was composed of dried lava! 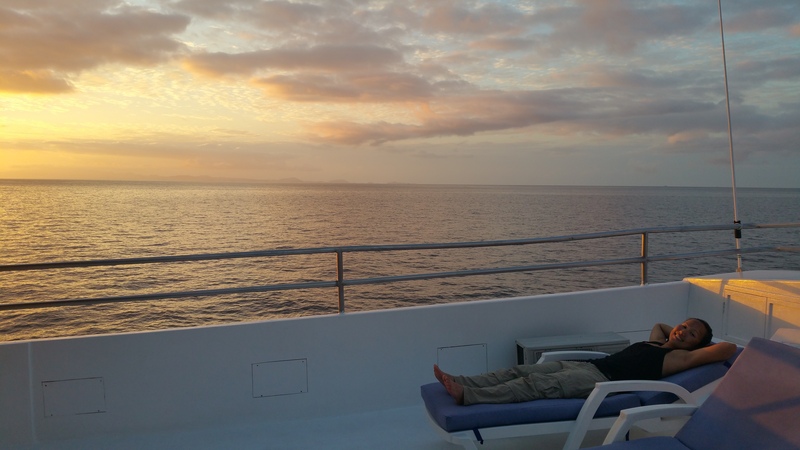 As you can see, everything about the Galapagos was amazing. The wildlife, the beaches, the diving, the excursions, the cruises. 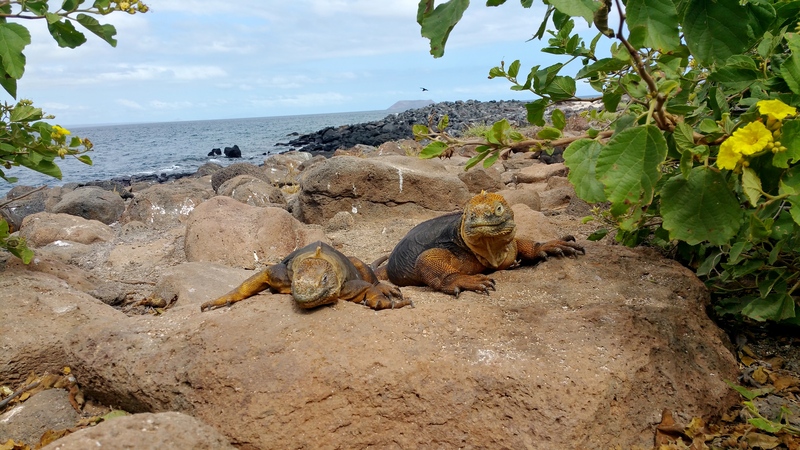 Both of South America’s remote islands of the Galapagos and Easter Island are trips I will hold dear in my memory…I cannot gush enough about both of these incredible places. 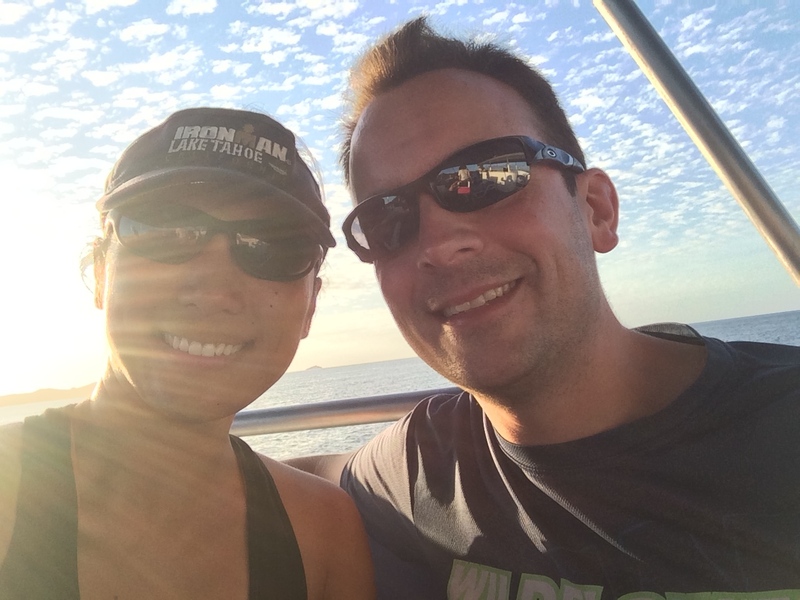 As I’ve stated at the beginning of this post, Chris and I had originally planned on skipping the Galapagos. We sure are glad that we didn’t. 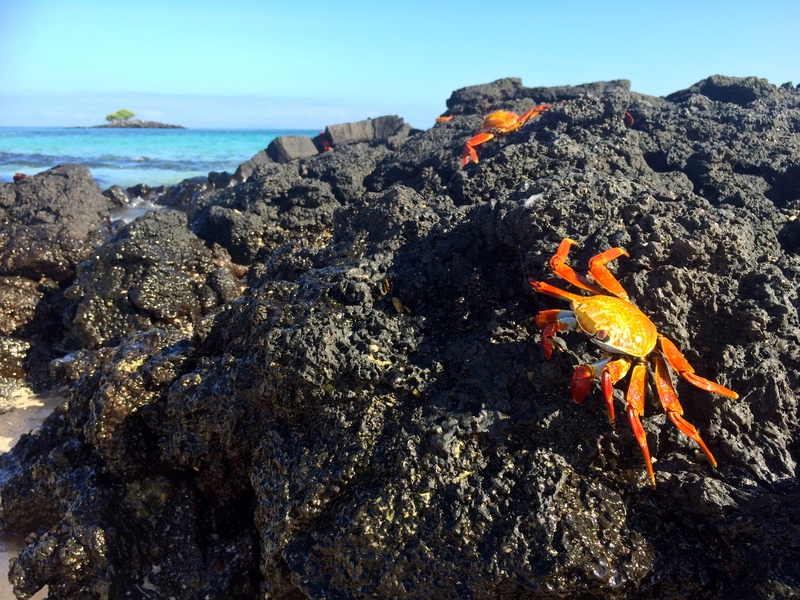 This entry was posted in Ecuador and tagged galapagos, gordon rocks, north seymour. Bookmark the permalink. 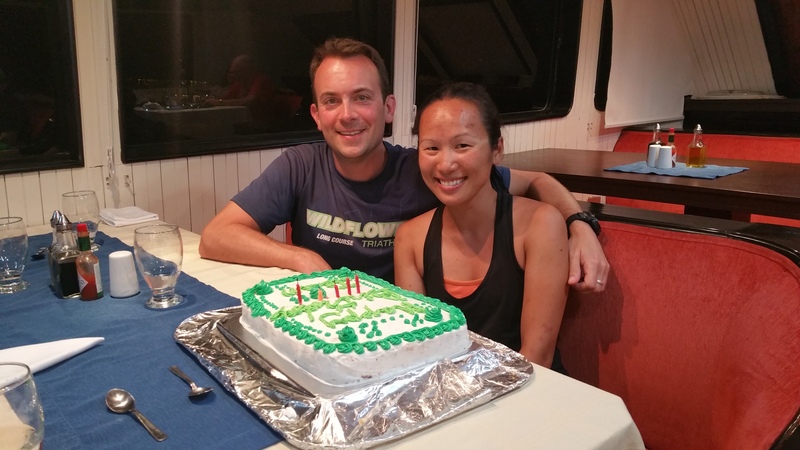 thanks for sharing a great trip. We’re going in April and hope we see as much as you were able to. wowza, that’s some advanced planning! you’re going to have an incredible time. everyone does. enjoy the wildlife!